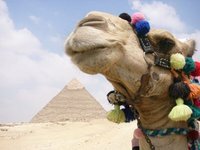 Giza is the home of the Great Pyramid and the Great Sphinx, two of Egypt's most famous attractions. Situated on the Giza Plateau, the last-remaining of the 7 Wonders of the Ancient World were built to overlook the ancient city of Memphis. Today, Giza is located just 20 kilometres from central Cairo, on the banks of the Nile River. Giza's three pyramids, known collectively as the Giza Necropolis, are found about 8 kilometres outside of Giza. The Necropolis consists of the Pyramid of Khufu (Great Pyramid), the Pyramid of Khafre and the Pyramid of Menkaure. For more information read the article: Pyramids of Giza. The Great Sphinx is at the eastern end of the Giza Necropolis, near the pyramids. It was probably built in the 3rd millennium BC, although who built it is a matter of dispute among scholars. From Cairo, you can take the train to Giza Station and then catch a taxi to the Giza Necropolis. If you are catching one of the black and white taxis, make sure that you negotiate the price before you get in the cab. It should usually cost between 15-20 Egyptian pounds. Also be sure to insist that you only want to go to the Necropolis, as some taxi drivers will try to take you to local shops as well. Alternatively, you can catch the yellow taxis, which are generally more reliable, and are metered. It is also possible to take an air-conditioned bus from Cairo, using the 355 and 357 routes. Catch it from Abdel Menem Riyad Station in Midan Tahrir, which is located next to the Egyptian Museum. There are quite a few western fast food restaurants in Giza, but if you feel like a slightly more authentic experience, there are also local food sellers. Tap water is drinkable but heavily chlorinated. You can purchase bottled water from small shops. Due to the area's great popularity amongst tourists, there are many upscale resorts in Giza. For more information, also check the long list of accommodation options in nearby Cairo. This is version 20. Last edited at 3:08 on Aug 2, 17 by sleepBot. 3 articles link to this page.